Not one, but THREE games parodied! Gravity bending twitch platforming. Party like it's two thousand and ten! I really like the overall feel of this game! It was pretty fun! I especially liked the bounce gravity mechanic. The mechanics overall seemed very well polished, however, I wish the character would turn left to right more snapily, I'd have an easier time with controls that way. Also, the teleports activating on death was a bit jarring. I didn't detract from the experience though! I liked the combined mechanics from the different games all being used together. The last level was a little frustrating to me but the quick respawn time and the limited number of elements you had to string together in a row kept me playing. I thought the controls were a little loose. The two levels with the backwards L portals and the last one in particular required jumps that I don't think should have been difficult, but I had a lot of trouble getting the player to move in the way that I wanted. Maybe a little more acceleration? Just a small nitpick though. Very nice overall! Music was nice and relaxing too. Just got out of the way and let you play. Well chosen. That was a fun ride! Was dreading the possible monstrous challenge at the end combining all my worst nightmares from all three games (fortunately it wasn't too bad) Platforming feels tight and zippy. 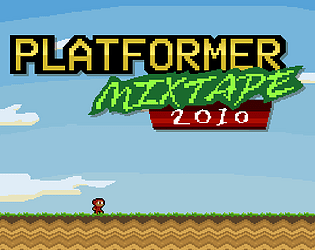 Platformers are still cool in my books. Smart things, was really cool to play till the end. Really like the use of parodied game aesthetics!